Trump’s GOP rivals did nothing Thursday night to block his path to the nomination. But the Trump portion of the evening was never out of the way, and Cruz could never fill the Trump-sized hole in the field left when the GOP front-runner spurned the Fox debate as “unfair.” On screens in the filing center, debate co-sponsor Google showed that more people were searching “Trump” than any other candidate during the debate he didn’t attend; all around me reporters were live streaming the surreal Trump “benefit” event a few miles away. 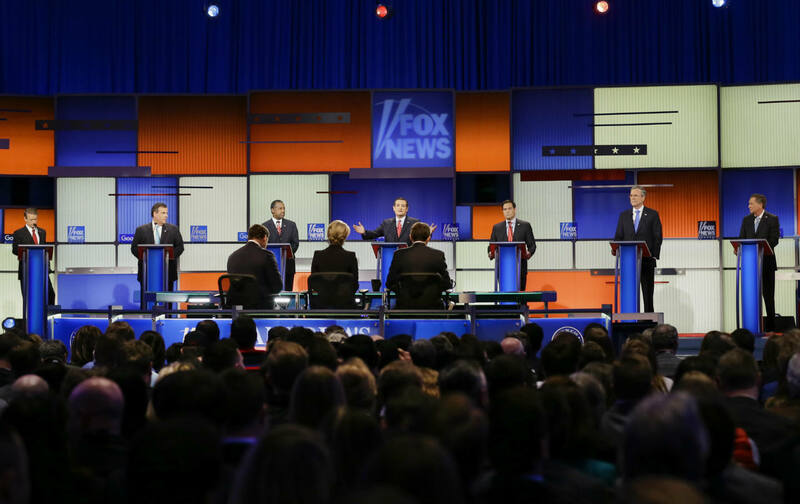 I was mildly curious to see what a GOP debate would be like with no Donald Trump. Would we see the smoldering wreckage of a party after the Trumpocalypse? Or get a glimpse of what the race might have looked like without The Donald? Sentimentalists might have hoped they’d get a glimpse of a pure, pre-Trump GOP state of nature, but of course that’s impossible. So many candidates are already casualties of Trump: governors like Scott Walker, Bobby Jindal, Rick Perry, and George Pataki, the guys with a track record, the stars on the GOP’s “deep bench” who were supposed to save the party from a devastating loss that was traced to the mediocre roster of 2012. “So did you,” Bush retorted. “So did you, Marco.” But a strong moment ended lamely for Bush once again. A testy Rubio then attacked Cruz. “You helped design George W. Bush’s immigration policy. Now you want to Trump Trump on immigration. We’re not going to beat Hillary Clinton with someone who’s willing to say anything to win an election.” But the sad clash had left all three of them looking like they’d say anything to win an election—and showed how mainstream Trump’s immigration position is within the GOP, rhetoric aside. The debate mattered most for Cruz, as a chance to help him regain the ground he’s lost in Iowa. I don’t think it did that. He never took control. He tried to pick a fight with Chris Wallace, accusing Wallace of attempting to get the candidates to attack one another. “It is a debate, sir,” Wallace replied coolly. Cruz then said if he got one more “mean question” he “may have to leave the stage.” It wasn’t clear whether or not he was serious; either way, the moment was awkward. The debate illuminated the vacuum at the heart of the Republican Party that has been filled by Trump. None of the candidates have the combination of smarts, charisma, and backbone that leading the country usually requires. Their massive cave-in on immigration, a sop to their nativist base, was the clearest example of their abdication of responsibility to govern, but foreign policy, where everyone pledged to kill ISIS deader than the other, but nobody said how, was a close second. Trump’s absence is likely to make GOP hearts grow fonder. At any rate, nobody did anything to stop his momentum on Thursday night.